Paints a highlight around in-focus edges, enabling very fast and accurate focusing on-the-fly without needing any additional tools. 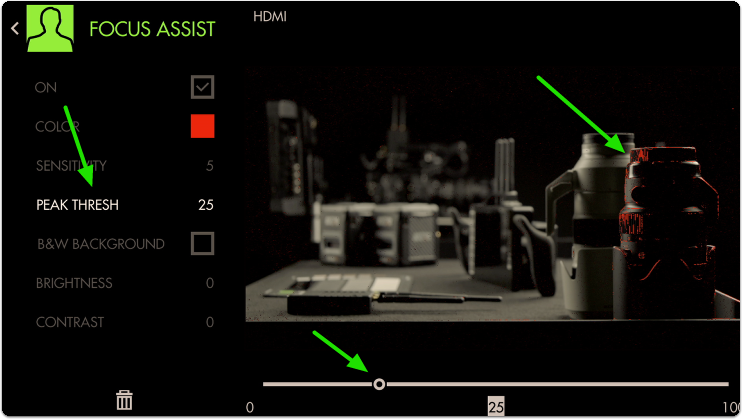 If configured properly, Focus Assist makes finding your focus point extremely easy- simply roll focus until your subject is displaying bright edge highlights. Focus Assist is the fastest method to find your focus point because of its pronounced effect on in-focus edges. Focus Assist is versatile and accurate, only at a slight disadvantage to Pixel Zoom in its overall utility since it doesn't allow for as much direct scrutiny of the underlying image, but at the advantage of speedy usage. Depending on how it is set up, Focus Assist generally has a pronounced enough effect on the image that it tends to require its own page to not confuse readings with another feature or other aspects of the image. If you wish to, for example be able to focus and expose your image on the same page with minimal overlays, perhaps try a combination of Peaking and Zebra. Focus Assist benefits from being configured for each camera due to differences in noise levels which can affect readings and exhibit false positives. Let's set it up! 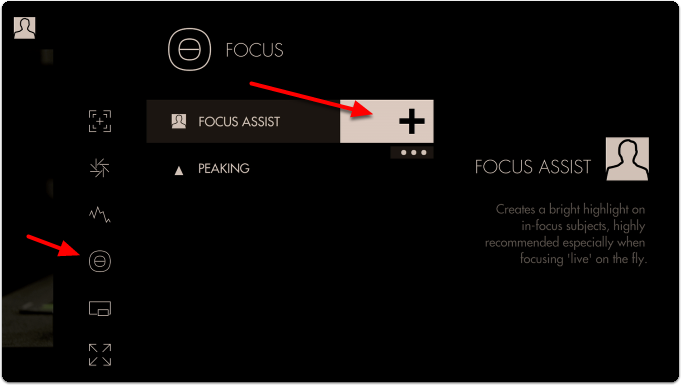 Navigate to Focus > Focus Assist and select to add it to the current page. Once added you can edit the settings by navigating right or tapping the right arrow when ‘Focus Assist’ is highlighted. The default sensitivity is usually a good starting point but if you are not seeing enough edge highlighting, give this value a boost. Notice how we are picking up many edges that are not in focus in addition to the areas that are in focus. Increase the next slider labeled 'Peak Thresh' to help eliminate the false positives. Now we are getting a much more isolated area of focus with this particular setup. A good rule-of-thumb for sensitivity/threshold is to adjust until image noise is just out of range of affecting the filter drastically. Some false positives will almost always be present and proper usage is generally about looking at the 'center of mass' of the colorized area as the focus distance. You can check 'B&W Background' to make the colorizing effect stand out more if viewability is compromised. Accurately rack focusing on-the-fly is now made vastly less tricky by way of Focus Assist! Sensitivity adjusts the intensity of Focus Assist - a low number causes a faint edge highlight, high numbers cause many more edges to be detected. Peak Threshold is like a 'confidence' slider, the higher the Peak Threshold, the more confident Focus Assist needs to be about an area to paint it as 'in-focus'. Increase this setting to taste after increasing Sensitivity for best results. Makes the underlying image monochrome so that the highlight color is more visible. Adjust the brightness/contrast of the image to feed Focus Assist with an adequate (ie not a flat log signal) source, translating into a clearer view of what is in focus. Any active exposure tools will respond to changes in brightness and contrast made here unless "Ignore Look" has been applied on each exposure tool - we recommend leaving these settings checked so that you are making exposure judgements off your original un-manipulated footage.